Ed Note: Today on the Headhunters Blog we have a guest writer. A good friend of ours Mark wrote this a month ago. I was keeping it in the vault for the right time. That day is today. 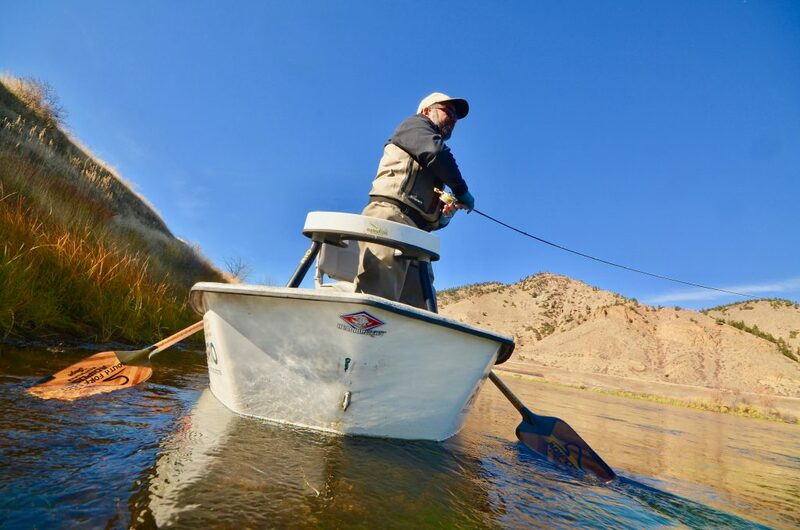 Mark attended the Headhunters Advanced Fly Fishing School this past October. Mark is a great angler that fishes, a bunch! You gotta fish a bundle to be good. And Mark is. Thanks Mark for scribing this article about Mother Mo. Enjoy the hump day article on the Headhunters Blog. Falling in love – with a river. I have to admit/fess up that I’m in love with the Missouri River. It didn’t happen fast. It wasn’t a love at first sight deal. It took a while. As a lifelong Montana resident there were just too many other things/places which kept me from making a pass at the ol’ girl. Our first real meeting was about 14 years ago. A quick stop while on a business trip. I knew nothing about her, but still managed to catch a fish below Gary Cooper Bridge on an olive wooly buggar. A person could call it a flirtatious introduction. It wasn’t until 10 years ago that I met her again. We were supposed to target walleye below the dam. Failure on that aspect led to a float out to Craig. I knew nearly nothing about her, but still managed to catch some fish. Nice fish. Large fish, hard fighting fish. It was at that point that she piqued my curiosity enough to try and continue the relationship. To the point that on business trips nearby, I would ensure that I was geared up to properly pursue my continuing education with her. On that trip, and all others since, I have come to know a fair portion of the Headhunters gang. Their unfailing willingness to give pointers, to even tell some secrets, has certainly been a key point in allowing me to solidify my relationship with the river. In truth I would not have the same relationship with the river that I do without their participation, and encouragement to continue to chase this gal. I may have MET her, but they officially introduced me to her. I have fished all over this state, creeks, rivers and lakes, some I have forgotten about, some I continue to see on occasion, some favorites I spend a good deal of time with. But the main draw is still the Missouri. It has become the gauge I use to determine the quality of the fishing. Not all can be compared to the river of course, a creek with 14” brook trout is just not the same experience. Not a bad experience, can even be a great experience, just different. Of course the Missouri, like all ladies, can be a fickle………..river. You can, and likely will given enough time, get blown off the river. That’s Central Montana, perfect weather one day, screaming wind the next. Or snow, or below zero temps. But getting through those rough times is what makes a relationship stronger. A typical long-term relationship. Long enough that sometimes you know you shouldn’t be making that long drive, in terrible conditions just to see her, but you do anyway. Now, after a solid 8-year relationship, I know more about her, much more. Do I know everything? Absolutely not, who does in any relationship? Are there still surprises? Certainly. Disappointments? Of course! But they come fewer and further between at this stage in the dating game. We’ve reached a sense of comfort with each other now. Too old for either one to change, and neither one asking for a change. And, you know you are still completely and totally smitten when you reach the point that you think of her, and your next visit together, every single day that goes by.